There’s colour, smells, gossip, vibrancy and everywhere, food. A boy walks through the market, his white skin in stark contrast to the brown faces around him. His mother is stressed and unsure, but he’s taken the first step on a new road. 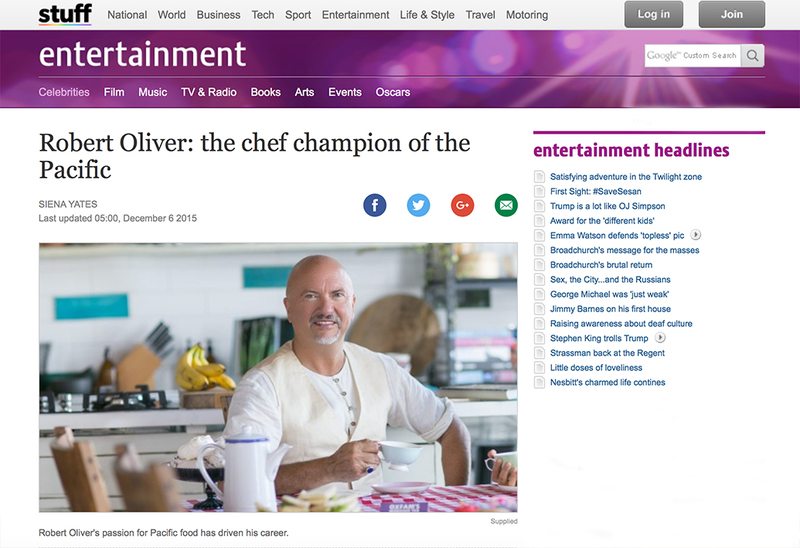 He will go on to become an accomplished chef, win awards, head development work, become a television personality, and – when he can – return to that magical marketplace in Suva, Fiji. Now, many years later, Robert Oliver is a two-time Gourmand Award-winning chef and food writer, but still remembers that day. He had moved to Fiji with his family where his father set up YMCAs which did “development work” – he makes the air quotes with his fingers. “I don’t like to call it that, because it’s usually me that gets developed,” he says. He still does similar work in the Islands, following in his father’s footsteps, spurred on by that marketplace. “It’s all gossip and drama and fruit and vegetables. Arriving in this country where everyone was brown and just the shifting gears of that coming from New Plymouth. The colour and hearing people really belly-laughing everywhere, it’s so exciting, you feel really alive,” Oliver says. He went on to spend time in Samoa, New Zealand, Sydney and then New York, where he stayed for 17 years. You’d think it would’ve been a massive shock, going from Island life to the city that never sleeps, but Oliver found the “vibrancy of the Islands” again in New York. “It’s like the university of life, it’s so creative and so alive, where all this great thinking emerges,” he says. It turns out he loves being a foreigner. He lived in China for three years without knowing the language, and loved the feeling it gave him. “It’s just a way of being there, being in it but still observing,” he says. It’s how he’s built his career. His award-winning books, Me’a Kai: The Food & Flavours of the South Pacific and Mea’ai Samoa: Recipes and Stories from the Heart of Polynesia were made by observing, documenting, and sharing Pacific food culture. So when he’s thought, “I’m just a palagi, everyone’s going to shoot me down”, it’s this other vein of thought which pushes him through: for example, when Oliver was asked to host Maori TV’s Marae Kai Masters. “But then I just thought, what an honour to be asked,” he says. And working on that show and of course, My Kitchen Rules, where he is a panellist, Oliver has had a chance to see New Zealand’s unique food identity emerging, with contestants in both bringing local food and flavour to their dishes. Seeing that “captures people’s hearts”, so that even if they don’t realise the cultural impact these television shows are having “they feel it; we are a Polynesian nation”. “I love the Maori and Pacific food relationship, it’s community first and the giving and sharing of food embodies that, the mana around who gives you food and what you do with it – I love it,” he says. We need a Pacific restaurant in Auckland, he says. Something that shows off these pacific foods and embodies those associated feelings. “I should probably take charge of that,” he says. There is a cafe in Sandringham he says is doing well with Polynesian cuisine (it’s called Blue Rose, and if you go, apparently the Koko Samoa cake is a must), but what we need is a proper restaurant, preferably in central Auckland. “I am thinking about it. I’d like it to be downtown, just to say: ‘this is Auckland’. I don’t know how I’ll do it, but I think it’s the next thing. I think it would say: ‘we are a Pacific nation’, and that’s important to me,” he says. But before that can happen, he has two more books to finish and a couple more tight-lidded television projects to worry about.